The Town of North Brentwood, incorporated in 1924, is the oldest incorporated African-American municipality in Prince George’s County. The small town is located south of the City of Hyattsville and north of the Town of Brentwood. It is bounded on the east by the CSX (formerly the Baltimore & Ohio Railroad tracks) railroad and to the north by the Northwest Branch of the Anacostia River. The Town of Brentwood is located to the south and west of North Brentwood. North Brentwood was planned specifically for African-American families by Captain Wallace A. Bartlett, a white commander of the U.S. Colored Troops during the Civil War (1861-1865). Born in New York in 1844, Bartlett worked as a patent lawyer, real estate investor, and director of the First National Bank of Southern Maryland. In 1887, Bartlett moved his family from Washington, D.C. to a 206-acre farm located northeast of the city adjoining The Highlands (now known as Cottage City). Bartlett formed the Holladay Land and Improvement Company with J. Lee Adams and Samuel J. Mills in 1891 and platted a residential suburb surrounding his home. The section south of the Northwest Branch of the Anacostia River was called Holladay Company’s Addition to Highland, while the northern portion was called Holladay Company’s Addition to Hyattsville. The northern part of the Addition to Highland, now known as North Brentwood, was often subject to flooding from the nearby branch. 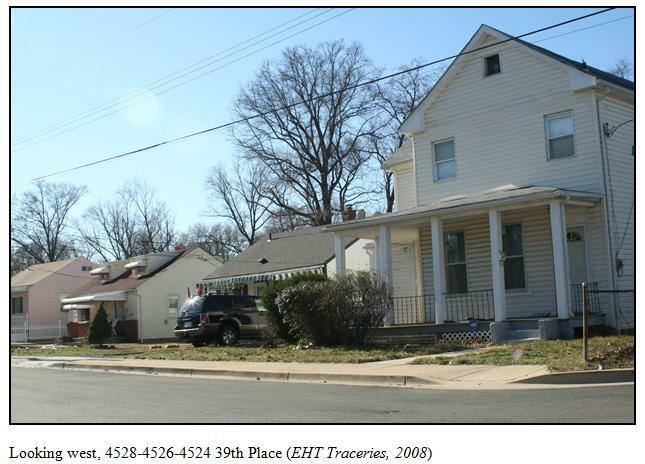 These less desirable lots were sold at lower prices than those located to the south, and were marketed towards African-Americans. The Holladay Land and Improvement Company sold the first lots in 1891 to Henry Randall, an African-American from northern Anne Arundel County. By 1893, Randall’s son, Peter, constructed a dwelling on an adjoining lot. Within several years, three other members of the Randall family purchased lots and constructed wood-frame dwellings in the immediate vicinity. This northern section of the Holladay subdivision was commonly referred to as Randalltown. In 1898, the City and Suburban Railway Company extended the streetcar lines through Randalltown, connecting the town to Washington, D.C.
By 1904, the entire subdivision was named Brentwood, and a post office of that name was established. The name Brentwood was taken from the nearby Brent family property, which was located approximately one mile to the west of Washington, D.C. The Brentwood plantation was established by Robert Brent, the first mayor (1802-1812) of the District of Columbia. The road that led from the old Brentwood plantation to Bartlett’s new subdivision was still known as Brentwood Road and Bartlett applied the name Brentwood to his community. However, the name of Randalltown was still used to define the black community located in the northern section of the subdivision. The unofficial boundary between the two communities was Webster Street (then known as John Street). By the early twentieth century, Randalltown was an established community with two churches, a school, and a civic association. The Baptist Church was formed in 1905 under the leadership of Reverend James Jasper and the first church was built in 1908 on the south side of School Street. A congregation of Methodists began to meet as early as 1913, but a church was not constructed until 1920. It still stands at 4037 Webster Street. The first school, which opened in 1902, was built on a lot that had been reserved for it on Bartlett’s original 1891 plat. The school was later demolished and the site is now a community park with tennis courts. The Brentwood Colored Citizens Association was established in January 1907 under the direction of William Conway, who moved into Randalltown from the District of Columbia in 1905. Census records as well as the suburban directory from 1912 give clear demographic information of the developing community. The working-class neighborhood had grown from a population of 65 in 1905 to 315 people in 1910. Typical employment for the residents of Randalltown included day laborers, domestic workers, seamstresses, drivers and cooks. Some worked at the Government Printing Office, served as messengers at government offices or porters for the railroad. The community also had a grocer, barber, teacher, and school principal. The southern portion of the subdivision, which was separated from the black population in Randalltown, was incorporated in 1922 and became the Town of Brentwood. 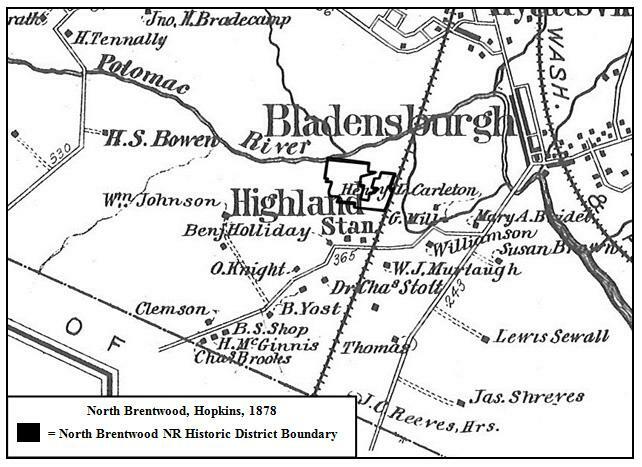 In 1924, Randalltown was incorporated and renamed North Brentwood, making it the first incorporated African-American community in the county. 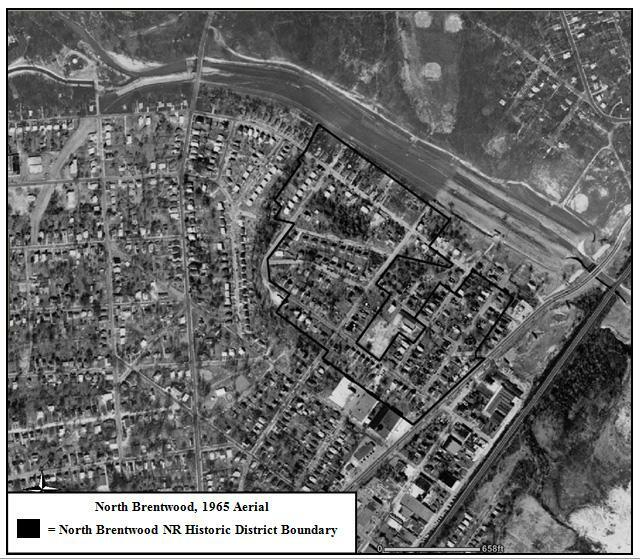 During the 1920s and 1930s, the population of North Brentwood expanded and improvements were undertaken at a greater rate than previously experienced. Despite the effects of the “Great Flood of 1933,” which caused substantial damage in the community, insurance maps from 1939 and 1940 indicate significant growth. The maps show two churches, a firehouse, three stores, a lumber company, as well as 138 dwellings. By the end of World War II (1941-1945), the street names in North Brentwood were renamed to follow the system of street naming throughout the Washington suburban area. At the time, the town’s population was close to 1,500 and boasted a new six-room schoolhouse, two wood-coal-ice dealers, three grocery stores, three beauty parlors, a barber shop, laundry, lumber yard, dentist, lawyer, notary, and a police and fire station. Improvements in the community were made throughout the mid-twentieth century and included the paving of streets, extension of some streets, and the construction of a municipal building in 1952. By the third quarter of the twentieth century, residential construction slowed. 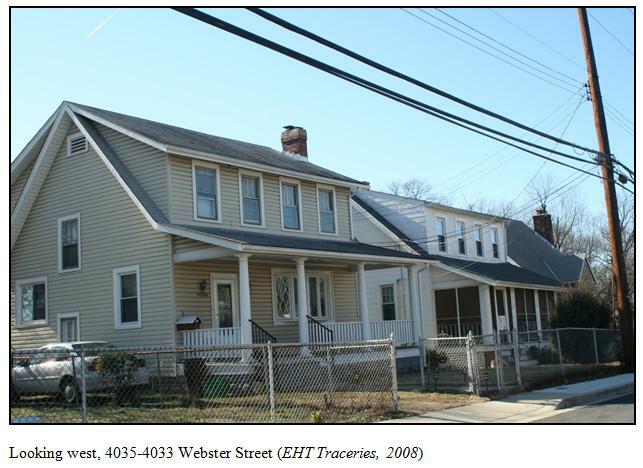 In the 1970s and 1980s, the community received a number of federal and state grants, which they used to improve and renovate a number of houses in the community. Today, North Brentwood remains a significant African-American community with approximately 500 residents. There are currently no designated Historic Resources in the community. 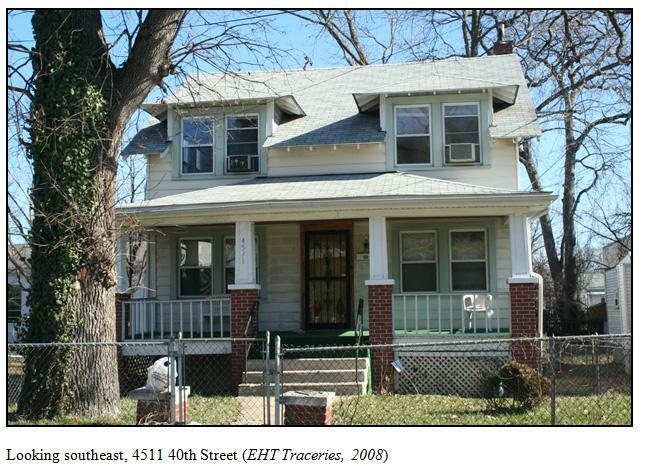 In 2003, the North Brentwood Historic District was listed in the National Register of Historic Places. The district was nominated under Criteria A and C and is significant under the themes of architecture and community planning/development. The period of significance extends from 1891 to 1950, encompassing the platting of the neighborhood through the last distinct phase of development just after World War II. 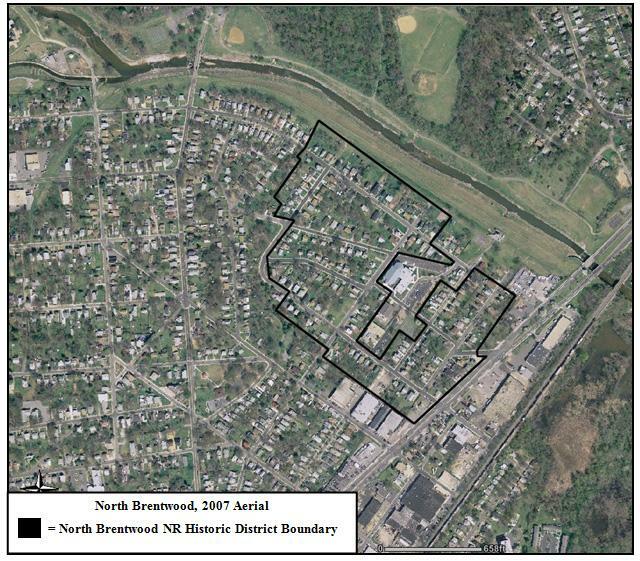 North Brentwood contains 128 contributing primary resources and 60 non-contributing primary resources. Buildings are predominately residential, but the district also includes two churches and three commercial buildings. Buildings are typically set close to the street, which are lined with paved sidewalks. 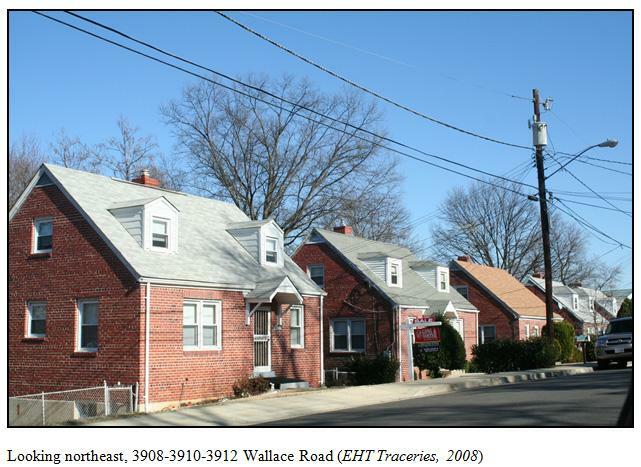 Buildings in North Brentwood date from the late nineteenth century through to the 1970s and range from small, one-story houses to large two- and two-and-one-half-story dwellings. Building forms include front-gabled houses, I-houses, detached rowhouses, Foursquares, bungalows, Cape Cods, ranch houses, and split-foyers. Architectural styles in the district are usually vernacular or modest interpretations of popular styles including Queen Anne, Colonial Revival, Craftsman, and various illustrations from the Modern Movement. 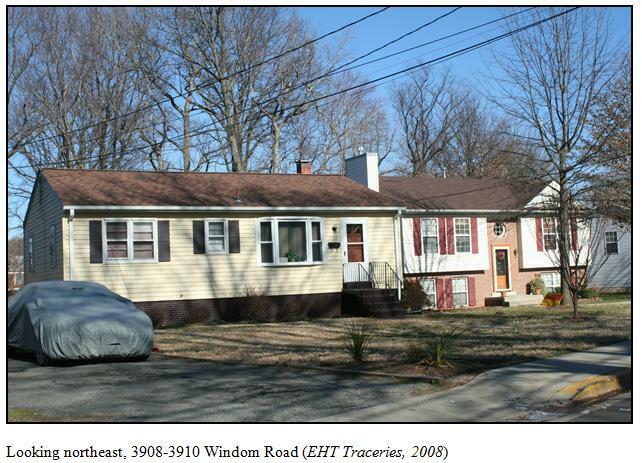 A windshield survey of North Brentwood was conducted in February 2008. There were no visible changes within the boundaries of the district, which was listed in the National Register of Historic Places in 2003. Typically, the buildings have remained free of alterations and additions. Minimal alterations consist of cosmetic changes, including the addition of vinyl siding, window replacements, and changing roofing materials. 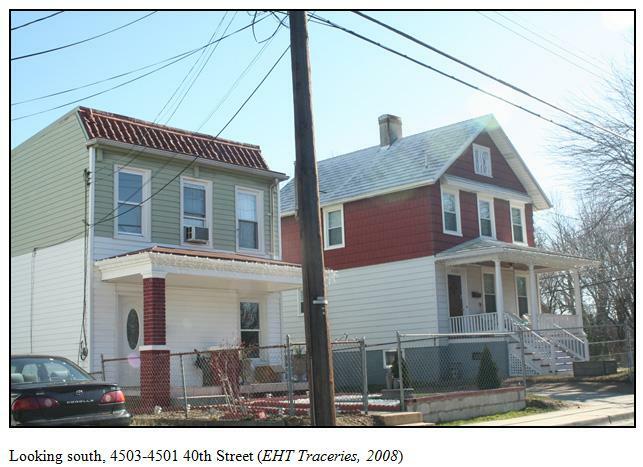 There has been very little infill within the district, which has remained a very cohesive and intact community. The boundaries of North Brentwood have not been compromised and both the district as a whole and the boundaries retain their integrity. 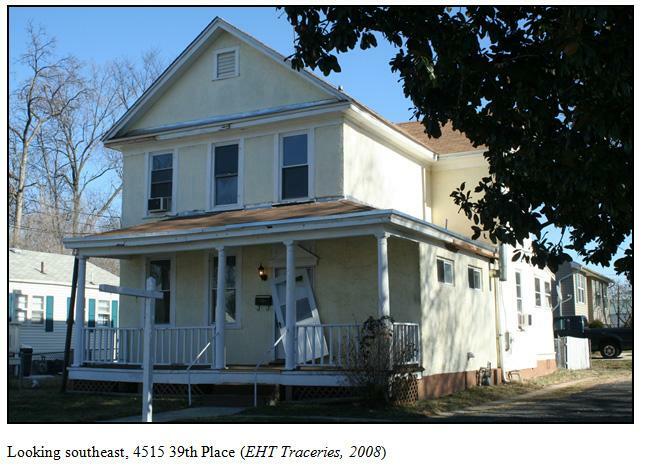 (1)(A)(i) and (iv) – North Brentwood is significant as a planned residential community for the growing African-American population in the Washington metropolitan area in the late nineteenth century. The neighborhood was platted by Captain Wallace A. Bartlett, a white commander of the U.S. Colored Troops during the Civil War (1861-1865). Despite, or possibly because of, covenants that segregated residential neighborhoods in the nineteenth and early twentieth centuries, residents of North Brentwood managed to create the close, supportive community that exists today. Overcoming obstacles including segregation and repeated flooding in the neighborhood, North Brentwood evolved gradually through the efforts of a persevering working-class community. 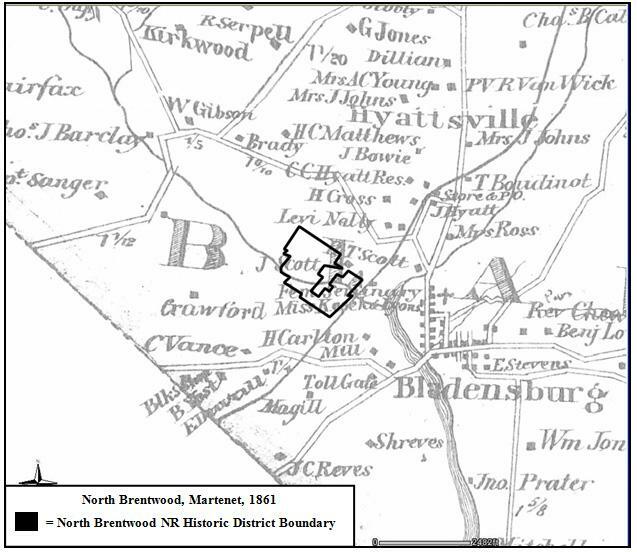 North Brentwood is also significant as the first incorporated African-American municipality in Prince George’s County. (2)(A)(i) and (iv) – The architecture in North Brentwood collectively embodies the distinctive characteristics of the late nineteenth century through to the mid-twentieth century. The community contains a cohesive collection of both vernacular and popular architectural forms and styles that evolved over a sixty-year time period. 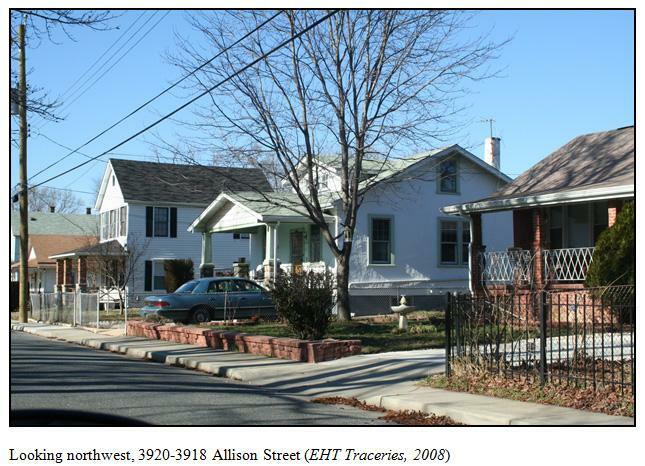 The earliest houses, modest I-houses, are complemented by front-gabled Queen Anne structures, detached rowhouses, American Foursquares, Craftsman-style bungalows, Colonial Revival-style Cape Cods, and illustrations from the Modern Movement that include ranch houses and split-foyers. 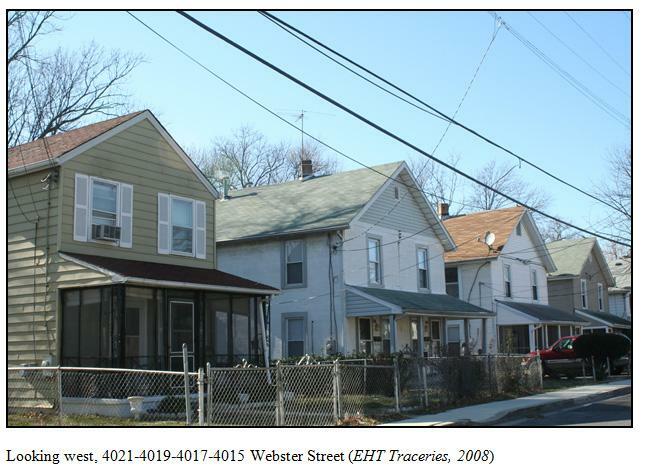 The modest ornamentation of the houses reflects their use for working-class residents. “Capt. W.A. Bartlett Dead,” The Washington Post, May 26, 1908. Susan G. Pearl, “North Brentwood Historic District,” National Register of Historic Places Nomination Form (February 2003), 8:3- 8:4. George D. Denny, Jr., Proud Past, Promising Future: Cities and Towns in Prince George’s County, Maryland (Brentwood, MD: Tuxedo Press, 1997), 281. 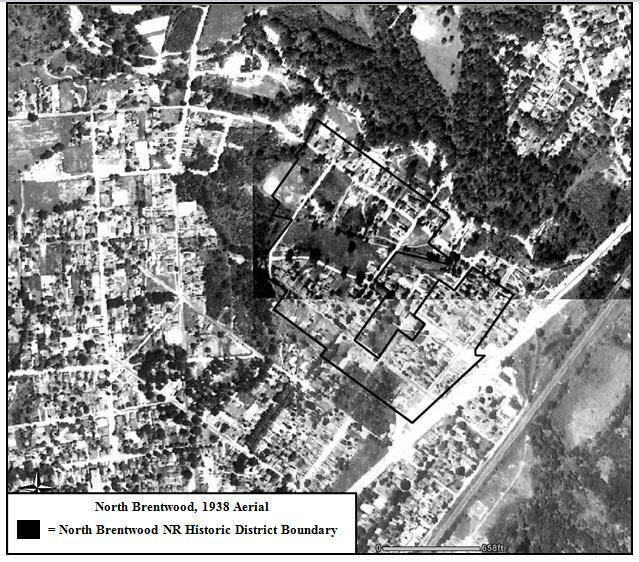 Susan G. Pearl, Historical Survey: North Brentwood, Maryland (Upper Marlboro: M-NCPPC, 1992), 14. James Goode, Capital Losses (Washington, D.C : Smithsonian Institution, 1979), 9. George D. Denny, Jr., Proud Past, Promising Future: Cities and Towns in Prince George’s County, Maryland (Brentwood, MD: Tuxedo Press, 1997), 283-284. Bianca P. Floyd, Records & Recollections: Early Black History in Prince George’s County, Maryland (Upper Marlboro: M-NCPPC, 1989), 111-112.